Lanser is proud to announce that the Virginia Grove development has been awarded the prestigious Best Masterplanned Development 2018 by the Urban Development of Australia (SA). Bringing a new sense of vibrancy to the township of Virginia with a contemporary new range of allotment sizes and a focus on healthy living The Green and The Lakes at Virginia Grove have experienced strong sales, anchoring the development’s reputation as a premium address in the North. Now Virginia Grove has a brand new award to add to its list of accolades. Lanser’s award-winning masterplan includes plans for 750 new homes in addition to a comprehensive network of fitness trails and outdoor gym equipment, water features, lush landscaped linear reserves, playgrounds with a brand new Where We Grow Early Learning Centre established on site. The Green and The Lakes at Virginia Grove introduced new allotment sizes to the town that hadn’t previously been available. Smaller lots were created to suit first homebuyers and those looking to downsize, but it is its larger blocks offering deeper backyards that have proven most popular – a product with limited availability in the Northern Corridor. 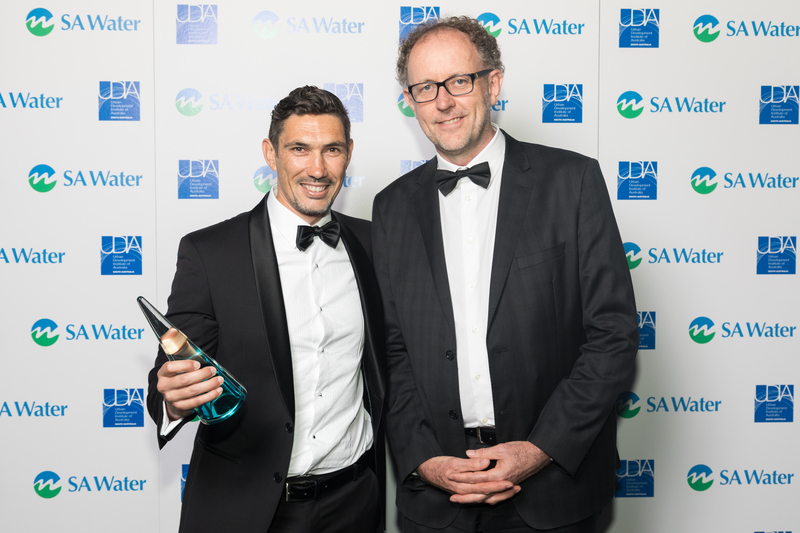 This latest recognition from the UDIA brings Lanser’s portfolio of award-winning developments to three – including Freeling Estate and Aspire at Evanston South. 2019 will mark 20 years in business for Lanser as the team continues to showcase their expertise in and passion for creating masterplanned communities that offer a focus on best practice urban design, walkable conveniences and creating a genuine sense of community. For more information about making Virginia Grove home, you can contact Lanser’s land consultants on 0452 134 626. Lanser Managing Director Jason Green accepting the award.